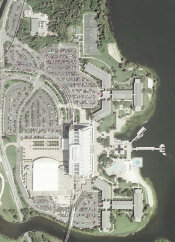 This picture is a satellite image of the Disney's Contemporary Resort. This picture is a satellite image of the Disney's Grand Floridian Resort and Spa with the Wedding Pavilion. 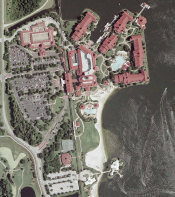 This picture is a satellite image of the Disney's Polynesian Resort. This picture is a satellite image of the Disney's Wilderness Lodge & Villas. 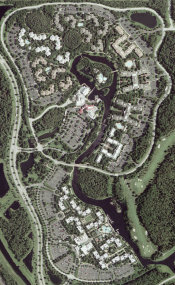 This picture is a satellite image of the Disney's first Vacation Club Resort the Old Key West Resort. 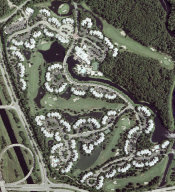 This picture is a satellite image of the Disney's Yacht & Beach Club Resorts & Villas. This picture is a satellite image of the Port Orleans Resort both Riverside and the French Quarter. Also have a traffic accident on the 4 lane near the French Quarter. 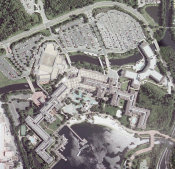 This picture is a satellite image of the Disney Institute as it is being prepared to be demolished to make way for the new Saratoga Springs Vacation Club Resort. 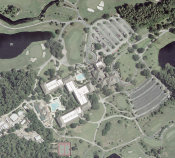 This picture is a satellite image of the Shades of Green Resort before they started their expansion.